Chateau Rauzan Gassies started out life in the middle of the seventeenth century. At the time, it was a part of the gigantic Rauzan estate owned by Pierre de Mesures de Rauzan. The massive Bordeaux wine property was over time split up again and again. By the time of the 1855 Classification, the once vast Margaux estate had given birth to not only Rauzan Gassies, but Chateau Rauzan Segla, Chateau Marquis de Terme and even Château Desmirail. After World War 2, in 1946, Chateau Rauzan Gassies was sold to Quie family. The Quie family continue to own Chateau Rauzan Gassies today as well as Chateau Croizet-Bages in Pauillac and Chateau Bel Orme Tronquoy de Lalande, a Cru Bourgeois estate in the Medoc. The 28.5 hectare, Left Bank vineyard of Chateau Rauzan Gassies is planted to 65% Cabernet Sauvignon, 25% Merlot, 5% Cabernet Franc and 5% Petit Verdot. The terroir is gravel and sand soils. Their best gravel parcels are located near the chateau. They also have vines planted close to Chateau Kirwan and Chateau Margaux. The average age of the vines is 35 years. The vineyard is planted to a vine density of 10,000 vines per hectare. Chateau Rauzan Gassies is one of the very few 1855 Classified Growths that do much of their vineyard work, using machine harvesting. Currently, 50% of the vineyards are harvested by machine. The wine of Chateau Rauzan Gassies is vinified in temperature controlled, stainless steel vats that range in size from 25 hectoliters to 150 hectoliters. The vats are new, having been installed after a renovation and modernization of the estate that was completed in 2013. At Rauzan Gassies, they now practice co-inoculation, which means that the alcoholic fermentation and malolactic fermentation take place at the same time. The wine of Rauzan Gassies is aged in 30% new, French oak barrels for an average of 12 months. On average, Chateau Rauzan Gassies produces close to 11,000 cases of Margaux per year. There is a second wine, Chevalier de Rauzan Gassies. With the terroir of Chateau Rauzan Gassies, one would hope they would produce better wines. But the wines have been weak at this estate for over 50 years. Due to a leasing arrangement, Chateau Rauzan Gassies could be changing hands in the future. Until then the Quie family remains in change. A complete renovation of Chateau Rauzan Gassies began taking place in 2013. Chateau Rauzan Gassies can be enjoyed on the young side with decanting. Young vintages can be decanted for an average of 1-2 hours, give or take. This allows the wine to soften and open its perfume. Older vintages might need very little decanting, just enough to remove the sediment. Chateau Rauzan Gassies is usually better with at least 6-8 years of bottle age. Of course that can vary slightly, depending on the vintage character. 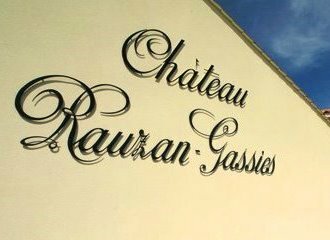 Chateau Rauzan Gassies offers its best drinking and should reach peak maturity between 10-20 years of age after the vintage. Rauzan Gassies is best served at 15.5 degrees Celsius, 60 degrees Fahrenheit. The cool, almost cellar temperature gives the wine more freshness and lift. The wine will also warm up in the glass as the aromatics develop. Chateau Rauzan Gassies is best served with all types of classic meat dishes, veal, pork, beef, lamb, duck, game, roast chicken, roasted, braised and grilled dishes. Chateau Rauzan Gassies is a perfect match with Asian dishes, hearty fish courses like tuna, mushrooms and pasta as well as cheese. Medium bodied with an herbal, leafy accent to the bright red fruits, a few years in the cellar will add more complexity and softness to the wine. On the bright red side of the style range, the wine is medium-bodied with nice floral overtones and a crisp, lean herbal and sharp red fruit finish. Medium-bodied and floral with ripe fruits and a lean character, this wine is produced in an old school, traditional style. Medium bodied, with a cherry, tobacco tinged, floral nose. Soft, but with firm tannins, and a finish that is about its red berry freshness, more time is still required here, for this to come together. From a blend of 75% Cabernet Sauvignon, 23% Merlot and 2% Petit Verdot, the wine opens with blackberry, pepper, earth and forest smells. Medium/full bodied and slightly rustic in its traditional approach, some tasters might like this more than others. Better on the nose, with its earthy, tobacco, cedar wood, red berries and forest scented aromatics than on the medium bodied, fresh, bright, crisp and clipped palate. Stylistically classic in its nature, some tasters are going to like this wine more than others. Light in color, fruit, complexity and probably fully mature. Smoke, tobacco, earth and sour cherry aromas, no fruit and too much acidity were the best of this bottle. The tart, sour red berry finish was undrinkable. If your looking at abottle with less than perfect provenance, it's not something you want to buy or drink. I have had better bottles on different occasions. Better in the nose than the mouth, with its earthy, leathery, 5 spice aromas, this wine was dried out, tart and lacking in pleasure. Little complexity in the perfume. It reminded me of dusty, tobacco laden fruit. In the mouth the finish was clipped short because a sour note seemed to intrude. Not a lot going on to enjoy. While not dead, it was gasping for air. This fully mature Bordeaux opened with smoke, tobacco, damp earth, fresh cut leaves and light berry aromatics. Medium bodied and slightly rustic in texture, this light Margaux will appeal to fans of light, traditional styles, more than it did to me. This is a beauty. Ripe, red berries are made even better with wet forest floor, tobacco leaf, smoke, truffle and earthy scents are all over the place. The tannins have some strictness, but the elegance of the Margaux appellation tires to poke through.